School visits & book series for youth of all ages. Mark’s life-changing messages inspire leadership, personal growth & self-empowerment for youth. Inspirational keynote and motivational speaking geared toward corporations & professional organizations about Conscious Leadership and living life without limit. Planned community outreach leadership events designed to inspire/educate youth & teens, including the Success Summit (S2) for teen leadership, and training programs for teachers to deploy leadership programs in-school. High content human factors safety & leadership training for companies in high risk fields geared to mitigate the risk of human error & enhance both employee safety and financial performance. 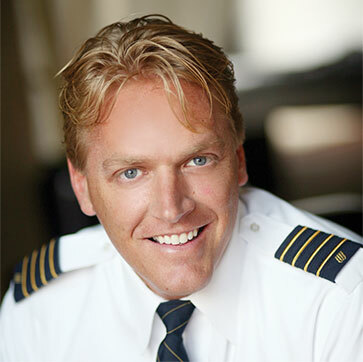 Mark Hoog is a successful entrepreneur, a sought-after motivational speaker, a bestselling author, the Executive Director of the Children's Leadership Institute, and a Captain with United Airlines. Having launched his career in the aviation field, Mark has delivered command and leadership training to the aviation industry's top pilots. With an emphasis on leadership, human potential, and achievement, Mark has trained pilots from around the world. Inspired by the loss of friend and mentor Jason Dahl (Captain of United Flight 93 on September 11) Mark authored the bestselling Growing Field children's leadership book series and founded the Children's Leadership Institute. Through the Growing Field series, Mark is introducing children across the globe to the the life-changing messages of personal growth, self-empowerment, and leadership. A National Award Winner, recognized in 2008 as the "Most Inspirational Youth Author," Mark has established the Growing Field as the voice in children's leadership literature. With a presentation that transcends age and industry, Mark's powerful message of Conscious Leadership is changing lives. Invited by corporations, professional organizations, and students of all ages, Mark travels the country inspiring people of all walks of life to make their own conscious decisions to live life without limit. Invite Mark to share his powerful message at your next event.